Hami Syahin was a regular in the Young Lions team this season. 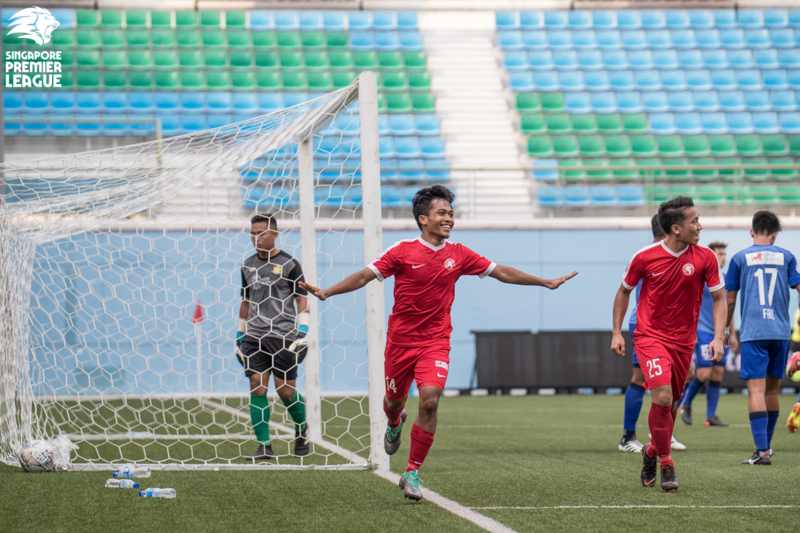 SINGAPORE, 8 OCT 2018 – When Hami Syahin was selected to be captain for the first time in his professional career, his main worry was giving the team-talk before coming out to the tunnel. The Young Lions midfielder fretted over what to say as the team warmed up for their Great Eastern-Hyundai Singapore Premier League (SPL) match against Albirex Niigata FC (S) last month and eventually sought the help of the internet. “Amer Hakeem (his Young Lions teammate) had to help me to Google what to say!” he chuckled. While words of inspiration might not come naturally to the 19-year-old, leadership on the pitch does. His authority is derived from his skill on the ball and the desire to set up his teammates. As an attacking playmaker, he tends to influence games through assists more than scoring.- a style that resembles that of his idol, former Barcelona maestro Andres Iniesta. Hami started football young, joining his current Young Lions coach Fandi Ahmad’s academy, Team 17 Soccer Connection, at the age of five. While playing for his school and the National Football Academy (now the FAS Football Academy), he was selected to go on overseas trials with the academies of German top-flight side Eintracht Frankfurt and French outfit FC Metz at 16 and 17 respectively. These experiences taught him important lessons. He then signed a professional contract with the Young Lions in 2015 and made his debut in the 2016 S.League (now SPL) season. Hami impressed almost immediately and midway through the season, he picked up the Pentagon Award for Up and Coming Footballer of the Year – the proudest moment of his career so far. Hami’s mother – behind him always. Hami’s family are his “number one fans” and he is driven to succeed by his mother, in particular. A single mother who is passionate about football, she has supported her son’s career all the way. The diminutive midfielder has already made one of his mother’s dreams come true when he came on as a substitute in The Sultan of Selangor’s Cup clash at the National Stadium in 2017. “She always told me, “one day, I hope that I can see my son play at the National Stadium’,” Hami said. “I tried to keep her dreams alive and that’s why I really wanted to focus on football and make her proud. Watch Hami score for the Young Lions. Hami is currently pursuing a diploma in Sport and Exercise Sciences in Republic Polytechnic while training with the Young Lions. He has school four days a week and training six times a week. Hami also wants to look for overseas opportunities after fulfilling his National Service commitments, to push himself towards the next level. Garnering 100 international caps is Hami’s definition of a successful career as it is “hard” to achieve that, given the small number of international matches each year. “If you play 100 over times for the National Team, it means that you are a good player and that the team needs you,” he said. But for someone who is yet to make his international debut, that seems like a very ambitious aim. Hami has been called up for the past few squads without managing to get his Lions bow, but he is undeterred. “It is disappointing,” he conceded. “However, my journey is long and I cannot just focus on this so-called ‘failure’.